Detention can be a pain at the best of times, but throw in a bunch of bloodsucking aliens, time travel, and some killer tunes and things are gunna get even messier. 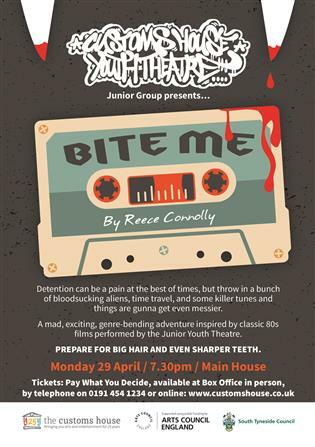 A mad, exciting, genre-bending adventure inspired by classic 80s films performed by the Junior Youth Theatre. Prepare for big hair and even sharper teeth. Reece Connolly is a writer/theatre-maker/professional geek who has had plays staged across the North East, at the Edinburgh Fringe and in London. Last year he was the Customs House’s first Young Writer in Residence as part of the Takeover Festival, and most recently his play CHUTNEY received a full off-West End production at The Bunker theatre, achieving 4 and 5 star reviews and 4 Offie award nominations.